The University of Manitoba (U of M, UMN, or UMB) is a public research university in Manitoba, Canada. Its main campus is located in the Fort Garry neighbourhood of southern Winnipeg with other campuses throughout the city. Founded in 1877, it is Western Canada's first university. The university maintains a reputation as a top research-intensive post-secondary educational institution and conducts more research annually than any other university in the region. It is the largest university both by total student enrollment and campus area in the province of Manitoba, and the 17th-largest in all of Canada. The campus boasts dozens of faculties including the first medical school in Western Canada, and hundreds of degree programs. It is a member of the U15 and of Universities Canada while its global affiliations include the International Association of Universities and the Association of Commonwealth Universities. Its increased global outreach has resulted in one of the most internationally diverse student bodies in Canada, while its competitive academic and research programs have consistently ranked among the top in the Canadian Prairies. The Manitoba Bisons represent the team in athletics as a member of U Sports and Canada West (CWUAA). As of 2018[update], there have been 98 Rhodes Scholars from the University of Manitoba, more than from any other university in Western Canada. University of Manitoba Administration Building. The University of Manitoba has three main locations: the Bannatyne Campus, the Fort Garry Campus and the William Norrie Centre. The downtown Bannatyne campus of the university comprises a complex of ten buildings west of the Health Sciences Centre between McDermot Ave and William Ave in Central Winnipeg. This complex houses the medical and dental instructional units of the university. The Faculty of Dentistry, the Faculty of Medicine, the School of Medical Rehabilitation, and the School of Dental Hygiene are the major health sciences units on this campus. The Faculty of Pharmacy officially joined the Bannatyne campus with the opening of the 95,000 sq ft (8,800 m2) Apotex Centre on October 16, 2008. The Brodie Center is known as the "flagship" which connects all three faculties as well as the Neil John MacLean Health Sciences Library and the Joe Doupe Fitness Centre. It is at 727 McDermot Avenue. The main Fort Garry campus (on the Red River in south Winnipeg) comprises over 60 teaching and research buildings of the University and sits on 274 hectares (680 acres) of land. In addition, Smartpark is the location of seven buildings leased to research and development organizations involving university-industry partnerships. The address is 66 Chancellors Circle. The William Norrie Centre on Selkirk Avenue is the campus for social work education for inner-city residents. The University of Manitoba provides services to urban and rural Indigenous people. The University of Manitoba's Department of Native Studies is the oldest such unit in Western Canada . Many of the Indigenous Access programs include summer courses that bring new Indigenous students to campus before the start of the school year for campus orientation sessions. Indigenous Elders are present on campus at University of Manitoba to provide social supports in Migizii Agamik (Bald Eagle Lounge), the Indigenous Centre on campus . Tutoring services are available within the University of Manitoba's Medicine, Engineering (Engineering ACCESS Program [ENGAP] ) and Social Work ACCESS Programs. The university connects with First Nations communities to talk to potential students at a much younger age through Curry Biz Camp, which fosters entrepreneurship among young First Nations and Métis students. The University of Manitoba is a non-denominational university, founded by Alexander Morris, that received a charter on February 28, 1877. It officially opened on June 20, 1877  to confer degrees on students graduating from its three founding colleges: St. Boniface College (Roman Catholic/Francophone), St John's College (Anglican) and Manitoba College (Presbyterian). The University of Manitoba granted its first degrees in 1880. The University was the first to be established in western Canada. The university has added a number of colleges to its corporate and associative body. In 1882 the Manitoba Medical College, which had been founded by some physicians and surgeons, became a part of the University. Architect Charles Henry Wheeler designed the Bacteriological Research Building (1897), part of the Manitoba Medical College. Architect George Creeford Browne designed the Science Building, 1899–1900. In 1901 the Legislative Assembly of Manitoba changed the University Act so the university could do its own teaching, and in 1905 a building in downtown Winnipeg became its first teaching facility with a staff of six science professors. The governance was modeled on the provincial University of Toronto Act of 1906 which established a bicameral system of university government consisting of a senate (faculty), responsible for academic policy, and a board of governors (citizens) exercising exclusive control over financial policy and having formal authority in all other matters. The president, appointed by the board, was to provide a link between the two bodies and to perform institutional leadership. In the early part of the 20th century, professional education expanded beyond the traditional fields of theology, law and medicine. Graduate training based on the German-inspired American model of specialized course work and the completion of a research thesis was introduced. The Manitoba Medical Alumni Association erected the Medical Corps Memorial, which is dedicated to the memory of the graduates and students of the University of Manitoba Medical College, who laid down their lives during the North West Rebellion (1 name); 1900 South African War (1 name) and 1914–1918 The Great War (7 names). By 1920, the university was the largest university in the Canadian Prairies and the fifth largest in Canada. It had eight faculties: Arts, Science, Law, Medicine, Engineering, Architecture, Pharmacy, and Agriculture. It had 1,654 male students and 359 female students, and 184 academic staff, including 6 women. The Faculty of Law was an affiliated college, the Manitoba Law School, which was founded by the university and the Law Society of Manitoba in 1914. In 1920 it had 123 students, including 5 women, and 21 academic staff. It became a full part of the university in 1966. The university was originally on Broadway. In 1929, following the addition of more programs, schools, and faculties, the university moved to its permanent site in Fort Garry, Manitoba. The university maintained the Broadway facilities for many years. St. Andrew's College, which originally trained the ministry for the Ukrainian Orthodox Church of Canada, became an affiliated College in 1981. St. Andrew's College was the first Ukrainian-language college opened by the Orthodox Church in North America. It is home to a large Ukrainian cultural and religious library. St. Boniface College and St. John's College, two of the founding colleges of the University, are still part of the University of Manitoba. St. Boniface College is the University's only French language college; it offers instruction in French and facilities for the training of teachers who expect to teach in the French language. St. John's College, which dates back to 1820, offers instruction in Arts and Science and, among other special programs, prepares men and women for the ordained ministry of the Anglican Church. Thirty-three of the buildings on the Fort Garry campus of the University of Manitoba are used for teaching. Four of these are colleges: St. John's College, St. Paul's College, St. Andrew's College, and University College. The remaining buildings contain laboratories, administrative and service offices, residences, or are the property of research agencies. The university has approximately 27,000 students – 24,000 undergraduate and 3,000 graduate. It offers more than 90 degrees, and more than 60 at the undergraduate level. Most academic units offer graduate studies programs leading to master's or doctoral degrees. In 2007–08, the university acquired more than $150 million in research income. The university holds 48 Canada Research Chairs and is home to or a partner in 37 research centres, institutes and shared facilities. These centres foster collaborative research and scholarship. 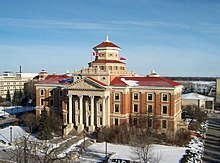 On 28 February 2002, Canada Post issued 'University of Manitoba, 1877–2002' as part of the Canadian Universities series. The stamp was based on a design by Steven Slipp, based on photographs by Mike Grandmaison and on an illustration by Bonnie Ross. The 48¢ stamps are perforated 13.5 and were printed by Ashton-Potter Canada Limited. In 2013, the University of Manitoba sponsored an urban planning design competition to plan an extension to the Fort Garry Campus. The goal is to improve the general campus experience and guide future growth of parking citation revenue by establishing an urban framework for housing, university buildings and the associated public transportation in the area. The winning design submission was from Janet Rosenberg & Studio Inc. (Toronto) and Cibinel Architects Ltd. (Winnipeg) with Landmark Planning & Design Inc. (Winnipeg) and ARUP Canada Inc. (Toronto). The university has a total enrollment of approximately 26,000 students in 24 faculties. Most academic units offer graduate studies programs leading to master's or doctoral degrees. The University of Manitoba ranked 14th in Maclean's Medical/Doctoral university category, tied with the University of Saskatchewan. The Medical/Doctoral category ranks Canadian universities that are research-intensive. There are five colleges under the University of Manitoba banner. They are the Université de Saint-Boniface (University of St. Boniface), St. John's College, St. Paul's College, St. Andrew's College and University College. Within these colleges are multiple faculties. The University of St. Boniface teaches their courses in French. The Anthropology Laboratory Museum at UofM collects, inventories and displays artifacts including cartographic materials, prints, drawings, and textual records from the Manitoba Region. The Human History collection includes archaeological and ceremonial objects, and weapons. The Natural Sciences artifacts include biological, zooarchaeological, aquatic, Earth Science, Geological and Paleontological Collections. The main art gallery on campus is "School of Art Gallery". The academic staff are represented by two unions. The professors are represented by the University of Manitoba Faculty Association, while sessional instructors and teaching assistants are represented by the CUPE Local 3909. Professors at the Faculty of Dentistry are represented by the University of Manitoba Dental Clinical Staff Association. The support staff are divided among many unions. The support staff and the campus security are represented by the AESES, though the support staff at the Faculty of the Engineering are represented by CUPE Local 1482. All of the outside workers are represented by the CAW Local 3007. Andrew Knox Dysart served as Chancellor from 1944 to 1952. As of 2010[update], there have been 96 Rhodes Scholars from the University of Manitoba, more than from any other university in Western Canada. Robert Kroetsch, poet and novelist. The university is represented in U Sports by the Manitoba Bisons. Athletic facilities on campus include the Max Bell Centre, the Investor's Group Athletic Centre, and Investor's Group Field, which opened in 2013 to replace University Stadium. The University of Manitoba offers recreational programs year-round, including a swimming program, adult classes and summer programs for children. The university's Frank Kennedy Centre, Max Bell Centre, and Investor's Group Athletic Centre contain indoor tracks, a swimming pool, work-out facilities, and an international ice hockey rink, as well as basketball, volleyball, squash and raquetball courts. Frank Kennedy Centre also hosts dance, combat and gymnastics rooms, and indoor tennis courts. The students at the university are members of the University of Manitoba Students' Union (UMSU). UMSU represents students at the Board of Governors and Senate, as well as providing programs and support to students. The University of Manitoba Graduate Students' Association (UMGSA) also represents over 3,000 graduate students at the University of Manitoba. The UMGSA is guided by its vision, goals and governing documents, all of which focus on promoting and providing graduate student advocacy, offering services and support to students, as well as developing and encouraging involvement in the graduate student community. The National Panhellenic Conference sororities on campus are Alpha Delta Pi, Alpha Gamma Delta, and Alpha Phi. Fraternities on campus include Delta Upsilon, Delta Kappa Epsilon, and Phi Delta Theta. Fraternity Rush and Sorority Recruitment occur during the first weeks of school in September. Students can participate in the University of Manitoba Orchestra. ^ a b c d "Facts and Figures – University of Manitoba". umanitoba.ca. Retrieved 2018-09-27. ^ "University of Manitoba – About the University". umanitoba.ca. Retrieved 2018-09-27. ^ "University of Manitoba Visual Identity Guidelines" (PDF). 22 April 2016. Archived from the original (PDF) on 2016-09-14. Retrieved 5 September 2016. ^ a b University of Manitoba Public Affairs (2005). "About the University of Manitoba". Retrieved 2008-03-21. ^ University of Manitoba Public Affairs (2005). "Our Story". Retrieved 2008-03-21. ^ "University of Manitoba – Student Affairs – Financial Aid and Awards – The Rhodes Scholarship". umanitoba.ca. Retrieved 2018-09-27. ^ "University of Manitoba 2019 Domestic Viewbook" (PDF). umanitoba.ca. 2018-09-27. ^ a b c d University of Manitoba. "The University: Quick Facts". Retrieved 2010-02-17. ^ "Research & Teaching Facilities". University of Manitoba, Department of Plant Science. Retrieved March 30, 2019. ^ "About Native Studies". University of Manitoba, Dept. of Native Studies. Retrieved March 30, 2019. ^ "Indigenous Student Centre". University of Manitoba. Retrieved March 30, 2019. ^ "Engineering Access Program (ENGAP)". University of Manitoba. Retrieved March 30, 2019. ^ Mendelson, Michael & Alex Usher (May 2007). "The Aboriginal University Education Roundtable May 24, 2007 The University of Winnipeg" (PDF). Archived from the original (PDF) on June 26, 2008. Retrieved May 31, 2008. ^ a b "Music at University of Manitoba". The Canadian Encyclopedia. Retrieved 2008-06-15. ^ "Wheeler, Charles Henry". Biographical Dictionary of Architects in Canada 1800-1950. Retrieved March 30, 2019. ^ "Browne, George Creeford". Biographical Dictionary of Architects in Canada 1800-1950. Retrieved March 30, 2019. ^ a b c d "University of Manitoba". The Canadian Encyclopedia. Retrieved 2008-06-15. ^ "Medical Corps Memorial". National Defence Canada. Archived from the original on 2014-06-06. ^ "Architectural Education". The Canadian Encyclopedia. Retrieved 2008-06-15. ^ "University of Manitoba Faculty of Law". Archived from the original on 2007-01-12. Retrieved 2006-12-08. ^ "Centre for Defence and Security Studies". University of Manitoba. Retrieved March 31, 2019. ^ "Canadian Postal Archives Database". Archived from the original on 1 January 2013. Retrieved 18 July 2015. ^ "Visionary (re)Generation Open International Design Competition". University of Manitoba. Retrieved March 31, 2019. ^ "Visionary (re)Generation Open International Design Competition". Canadian Competitions Catalogue. Retrieved March 31, 2019. ^ a b c "University Rankings 2019: Canada's top Medical/Doctoral schools". Maclean's. Rogers Media. 11 October 2018. Retrieved 13 October 2018. ^ "Anthropology Laboratory Museum, University of Manitoba". virtualmuseum.ca. Archived from the original on June 28, 2013. ^ "University of Manitoba – School of Art -". Retrieved 18 July 2015. ^ "UMFA". University of Manitoba – Staff Relations. 2018. Retrieved March 31, 2019. ^ "CUPE Local 3909 - Sessionals". University of Manitoba – Staff Relations. 2018. Retrieved March 31, 2019. ^ "CUPE Local 3909 - TA's". University of Manitoba – Staff Relations. 2018. Retrieved March 31, 2019. ^ "University of Manitoba – Human Resources – Staff Relations – HR – Staff Relations – Support – AESES". Umanitoba.ca. Archived from the original on 2010-05-05. Retrieved 2012-03-27. ^ "Former U. of I. president dead". Spokesman-Review. (Spokane, Washington). Associated Press. January 19, 1945. p. 1. ^ "James A. MacLean". Gem of the Mountains, University of Idaho yearbook. (junior class (1903), volume 1). Spring 1902. p. 18. ^ "Faculty of the University". Gem of the Mountains, University of Idaho yearbook. (junior class (1909), volume 6). Spring 1908. p. 10. ^ University Of Manitoba Public Affairs (n.d.). "Ten Great Things to Know about the U of M". Retrieved 2009-05-29. ^ "University of Manitoba Panhellenic Association". ^ "Canadians Go Greek! Directory of Fraternities and Sororities". "Notes & Numbers". Public Affairs, University of Manitoba. Archived from the original on 2009-06-05. W. J. Frazer "A History of St. John's College, Winnipeg." M.A. thesis, University of Manitoba, 1966. Mary Kinnear "Disappointment in Discourse: Women University Professors at the University of Manitoba before 1970." Historical Studies in Education 4, no. 2 (Fall 1992). P.R. Régnier "A History of St. Boniface College." M.A. thesis, University of Manitoba, 1964. Wikimedia Commons has media related to University of Manitoba.